Your son or daughter will have the week of their lives and get a great opportunity to make new friends and build self-confidence during their school holidays! They'll enjoy the experience of camp, with the chance to participate in exciting outdoor activities and explore a Christian worldview, whilst still going home to sleep in the comfort of their own bed. 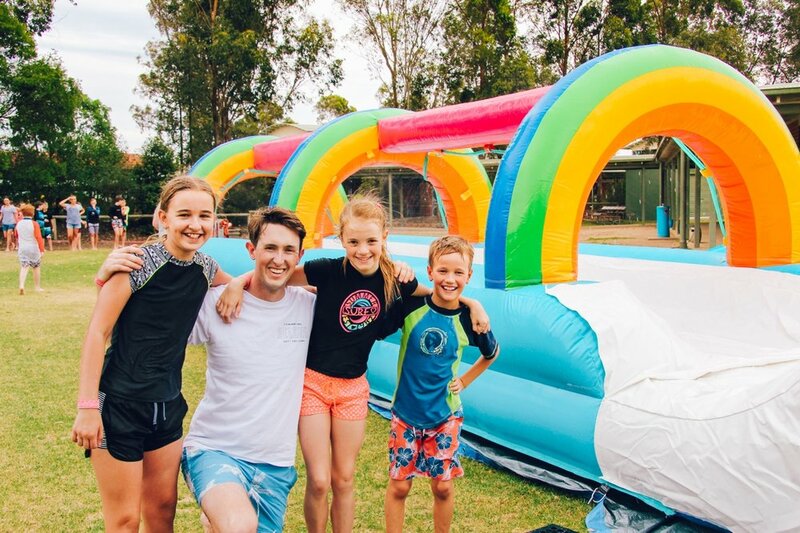 At our carnival campers will be able to get their face painted, win a balloon animal and have a go on the GIANT jumping castle (left). They'll also have a go at ring toss, egg and spoon races and much much more! All while having a ton of fun with new friends. Campers in years 3-6 will get the opportunity to put their stealth to the test using our Laser Tag equipment. In teams, campers will work together and develop tactics to tag the opposition. Last person standing, wins. Though everyone will have fun. Each day, campers will sing, play games and learn about the great God who loves them in our Christian Discovery sessions. Our trained Christian Leaders give campers an opportunity to learn about God in an open and trusting environment while having a lot of fun doing it. Our Splash Tunnel is the centre of our amazing water games. Campers will get to slide down the 10m tunnel while being sprayed from all angles by water. That's not all, we'll also have 100s of water balloons to throw around and plenty of other ways to get wet and have a great time. Take home your very own personalised pencil case craft. Spend time deciding how you want to decorate your case and then sit and chat with your friends and you do it yourself. You will be transferred to the CRU Camps website to complete your registration. Energetic young adult Christian leaders care for and mentor your children throughout camp and are supported by high school Assistant Leaders who can get alongside your child to help them make the most of every opportunity. There will also be a number of CRU Day Camps staff on camp to ensure that every camper is looked after and that the program is of high quality. To finish off our week, we invite all parents and family members to a free BBQ to meet the leaders and parents of other campers. After the BBQ we'll have a final concert where the campers will show off some of the things they've done on camp, we'll watch a photo slideshow from camp and campers will be able to see what they can do after camp to keep in touch with others and have even more fun. Kat works full time for Crusaders running school and holiday camps and attends St Paul's Castle Hill. She and the team from Harbour Church can't wait for a wonderful time with the kids on camp! Thank you for a wonderful CRU Day Camp experience this week. My 10 year old Isabelle absolutely loved it & couldn't wait to go everyday. Please pass on my thanks to all involved. She can't wait to go again next time. What a great ministry & blessing. Well done! The primary children greatly enjoyed the week, their parents gave very positive feedback, the three way partnership between CRU, our local church volunteers and our school staff/student leaders was fantastic. The leaders are nice, I've had lots of time with my friends and I don't think camp could be better! I thought the camp was wonderful. The children seemed to absolutely love it and the vibe around the school and church after the camp has been extremely positive. Looking forward to running another one. It was very exciting and there was a nice new activity every day. I loved it. CRU Day Camps are great value for money when compared to other options for paid vacation care.